India Outside My Window: Happy Pongal / Sankranti! Two days ago I was on a bus travelling through Tamil Nadu from Pondicherry to Bangalore. I passed villages where the preparations for Pongal were visible. Markets were bustling and crowded, sugar cane was for sale everywhere, as well as colourful ropes and bells. I assume the bells (and maybe the ropes too but I’m not sure) are for the cattle who are revered on the third day of Pongal, to thank them for their help with the harvest. Watching the scenes going by, I remembered that I had been on a bus at this time of year nine years ago, on my way from Villupuram to Tiruvannamalai. 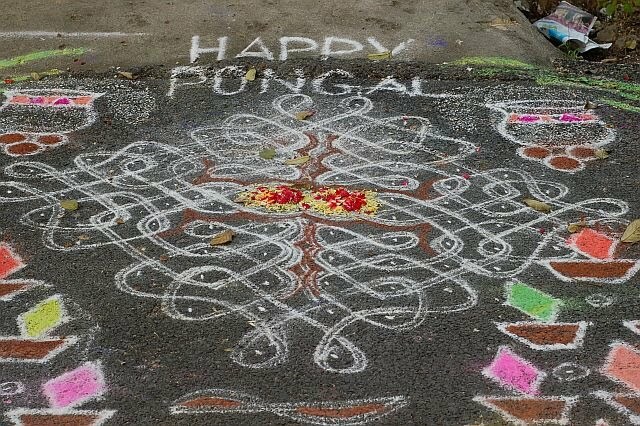 It was early morning and from the bus I had seen people drawing huge, elaborate rangoli designs in front of their houses, with drawings of sugar cane stalks and overflowing pots, symbolising abundance and the words Happy Pongal! written in Tamil and English. In Tamil Nadu this must be one of the most important festivals because it last three days, while in Karnataka it seems to be more low-key. 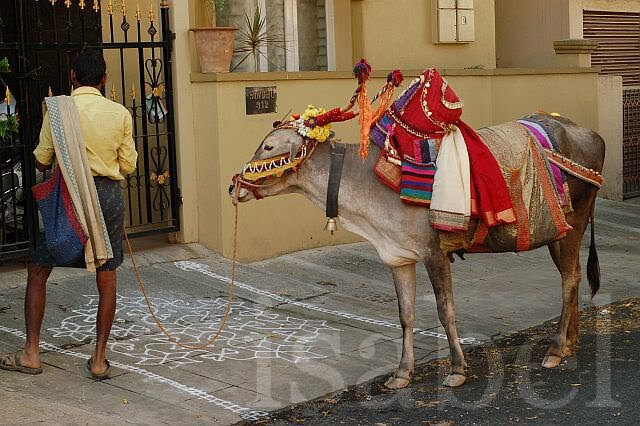 This man goes door to door with his cow, playing an instrument called Nadaswaram. I see him often in the neighbourhood, not only on festival days. 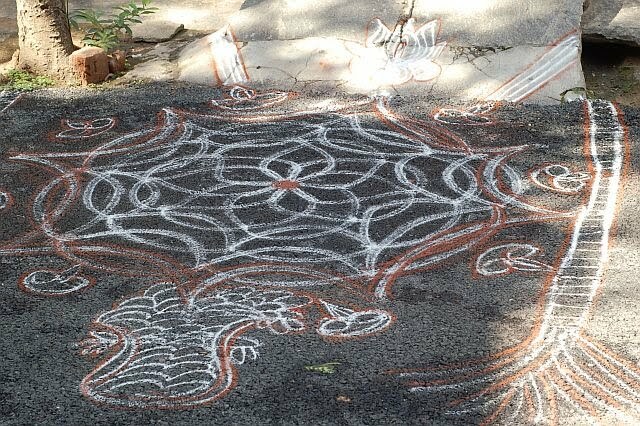 A rangoli with drawings of overflowing pots. 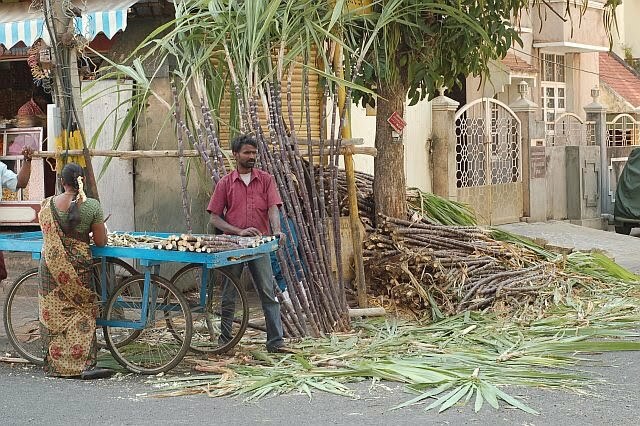 More overflowing pots, lamps and sugar cane stalks. 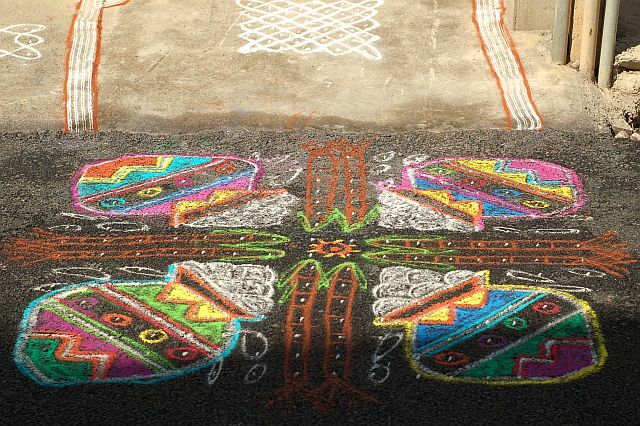 I had posted pictures of Sankranti rangoli I had taken a previous year here. That is a bull that the guy takes around from house to house.Shiva's vehicle is Nandi,(a bull)Hence he takes it around hoping people will give him some money as Nandi is in front of their doors. Also on Sankranthi,we make small packets of jaggery,sesame,peanuts,coconuts,sugarcane and sugar,and distribute to all our friends and relatives. All of the above are harvested this month.So ,we share with all .. Thanks Shubha! A bull is a male cow afterall, but let's call him Nandi. I noticed few people come to the door when Nandi comes calling. Maybe if his keeper played his nadaswaram better? It seems out of tune. Of course after I took that picture, he wanted a few 'paisa'! Nice blog . Keep blogging such things. Lovely pictures, Isabel. 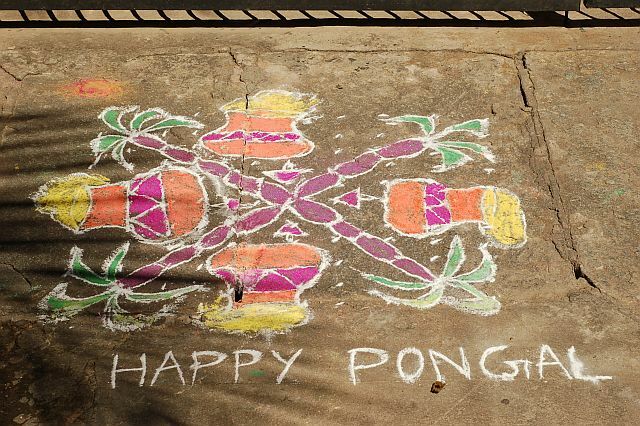 Happy Pongal and Sankranti to you !